This is not Photoshop and apart from being a photo editor, it bears no similarity to Photoshop. However, it is free, it is excellent and you should have it on your Windows PC because it is a good tool for creating artwork for use online. Think of it as Photoshop reimagined and simplified. 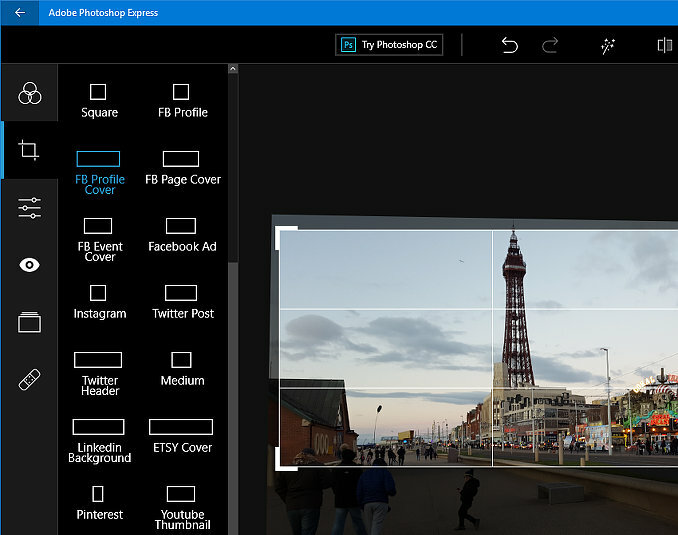 Get Photoshop Express from the Windows 10 App Store – search for it. It is also available on phones and tablets, too. Everything you need is in a toolbar on the left and the first icon enables you to fox problems in images and apply special effects. In the Basic section for example, is a collection of filters similar to those in photo apps for phones and in the Instagram app. One click on a thumbnail applies Vibrant, Autumn, Pastel, Haze, Silvered, Dappled, Glow and many other filters. There are B&W (black and white), Portraits, Nature, Pop-colour and Duotone sections, each with lots of filters for adding colour effects to images. 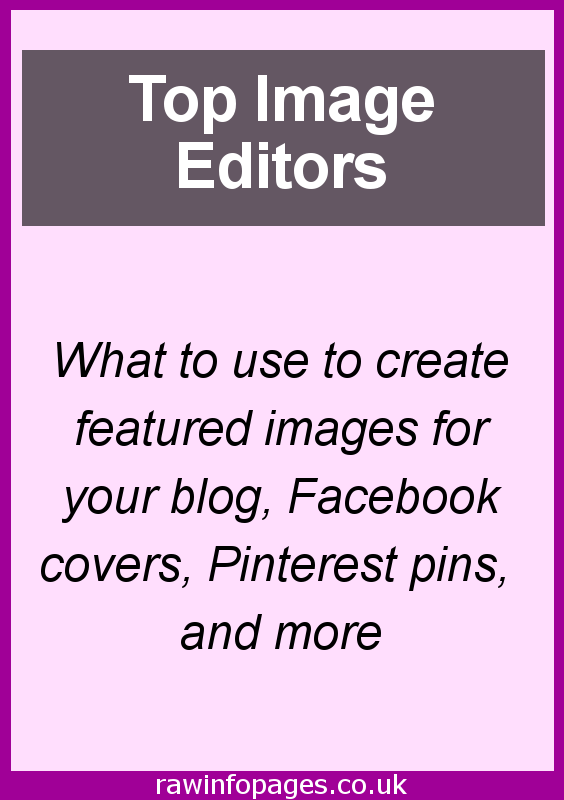 The crop tool is clearly aimed at bloggers, website owners, and people on social media. Normally with a crop tool in a photo editor you specify the size or drag a box on the image. With Photoshop Express there are lots of ready-made sizes, such as Facebook Profile Cover, Facebook Page Cover, Facebook Ad, Instagram, Twitter Post, Pinterest, ETSY Cover and so on. Click the social network image you want and the crop is overlaid on the image and it can be dragged to adjust the area selected. There is a good range of photo correction tools and they are organised into categories like Light, Colour, Effects, and Details. Select any of these and thumbnails show all the different options. Click one and a slider on the image lets you adjust the strength, such as more/less contrast, increase/decrease clarity and so on. This is a very good tool for fixing or enhancing photos and for cropping them to the exact size you need for various social networks. It does not do everything and it does not allow you to add text, such as for Pinterest images for example, but it is still excellent. 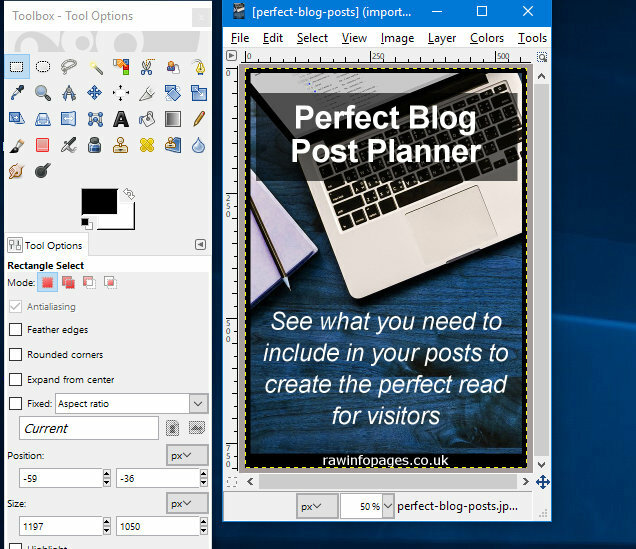 GIMP is a traditional photo and image editing application for Windows and Mac computers and it looks like it was designed to offer a Photoshop-like experience for free. You would struggle to find a photo editor for free that is as powerful as GIMP. The interface is a common one and there are floating windows that contain buttons for accessing tools and for adjusting the settings and parameters, like selection size, brush size, fill type and so on. It has a text tool that has a lot of options, such as font selection, size, character and line spacing, left/centre/right alignment, and so on. This is useful for creating images with text, such as for Pinterest. GIMP features multiple layers, so you can build images from layer upon layer, and rearrange layers with drag and drop. Layers and many tools have transparency settings. The tools all work on selections on layers. There is a good collection of tools for correcting and enhancing images, such as brightness, contrast, hue, saturation and adjustment of levels and histograms and lots of special effects. There is a steep learning curve with GIMP and it can be confusing at first. However, as you learn it, it becomes quicker and easier to use. There are no special features for creating images for blogs, websites, social media and so on, but if you know what size image is required, it is a great tool. PicMonkey is an online photo editor that runs in a web browser on a Windows PC or Apple Mac and there is no software to install. Just go to the PicMonkey website and you can create or edit images. However, there are mobile apps for use on phones too. Start PicMonkey and you can choose from a blank canvas, a ready-made template, or you can upload a photo from your computer. Once loaded, the toolbar on the left provides access to Basic Edits, Effects, Touch Up, Text, Overlays, Frames and Textures. Click any one of these and multiple tools are displayed and the range on offer is excellent. For example, in the Touch Up section are tools to remove blemishes and wrinkles, whiten teeth and apply fake tan, brighten eyes, ad mascara and many more. Overlays add stars, lines, arrows, symbols, comic bubbles and many more items. There are dozens of filters, a collection of fonts for adding plain or fancy text and so on. Borders and textures can be used for special effects and they are easy to customise. Of special interest for bloggers and social media are the templates. Click Open New or the t icon at the bottom of the toolbar and then click Category on the template screen. A little way down the screen is Facebook, Instagram, Pinterest, YouTube and Twitter. Select any of these and it has the exact sizes you need to create Facebook covers or post images, Pinterest pins, Twitter images and so on. Open one and you can edit it and make it your own. PicMonkey is an excellent online editor and it can be used for free. However, to save edited images back to your computer, and therefore use them on your blog, website or social network, you need a paid account. A basic account is not expensive though and there is a ton of features. Check the prices at PicMonkey. 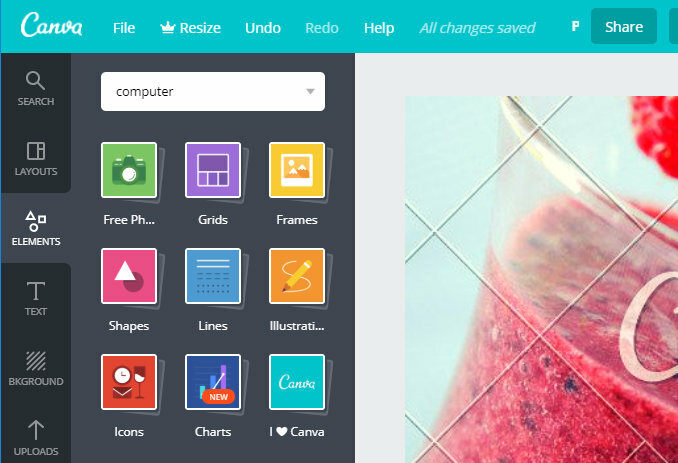 Canva is a popular choice for creating images for sharing on social media and blog posts. It runs in a browser window on your computer, Windows PC or Apple Mac, and you can use apps on your phone or tablet. It is free to use, but extra features, templates, photos and other things are available for a small fee. You start by selecting a template and there is a wide range to choose from, like magazine covers, photo collages, CD covers, infographics, book covers, desktop wallpaper and many more. 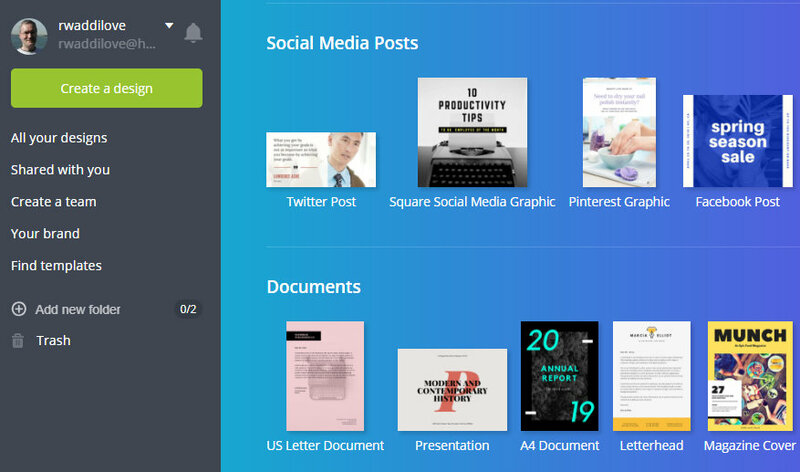 There are also templates designed for social media like Twitter, Pinterest, and Facebook. Select one of these categories and there are dozens, perhaps hundreds, of ready-made templates to choose from. The list seems to go on and on. After selecting a template, it has just the right dimensions you need and placeholder text, images and other items. These can all be customised and your own content can be added. 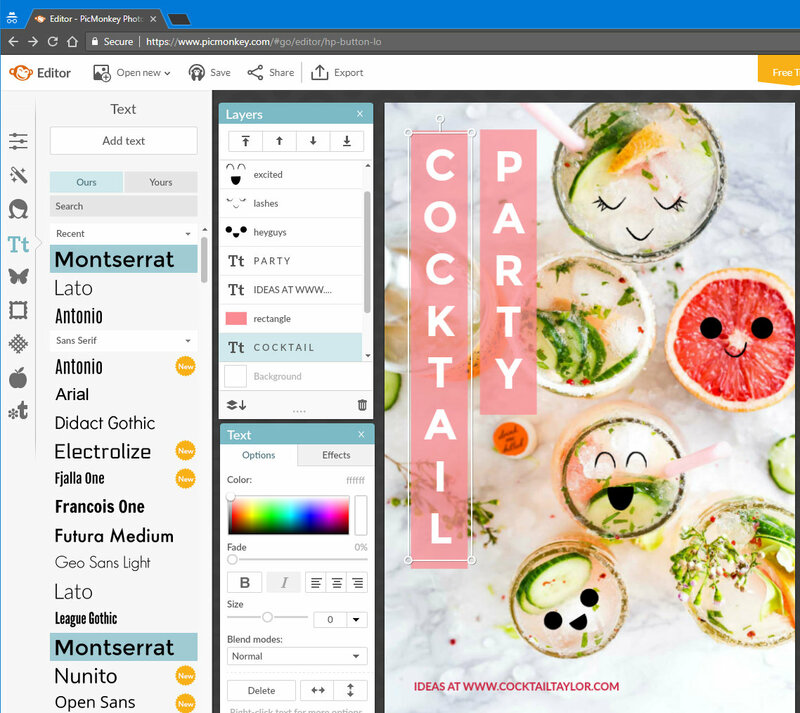 The Elements tab in the toolbar enables you to add photos, grids, frames, shapes, lines, illustrations, icons and more. Select one of these and there are huge libraries of items to choose from – one million images for example. There are free and paid items and both are clearly labelled so you can easily choose and keep it free or pay for higher quality items. Your own photos can be uploaded and used too. The text tools are excellent and there are ready made headings, subheadings and text templates that can be dragged and dropped on the image. 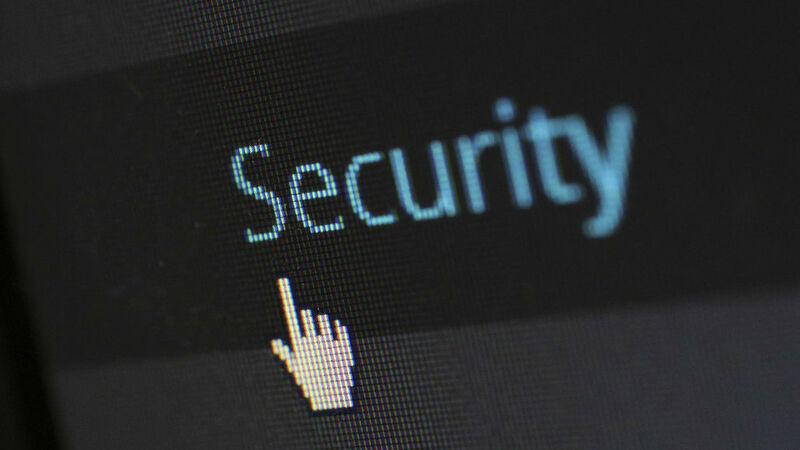 You then resized, select the fonts and colour, then edit the text and replace it with your own. Backgrounds can be added or replaces and there are many to choose from. 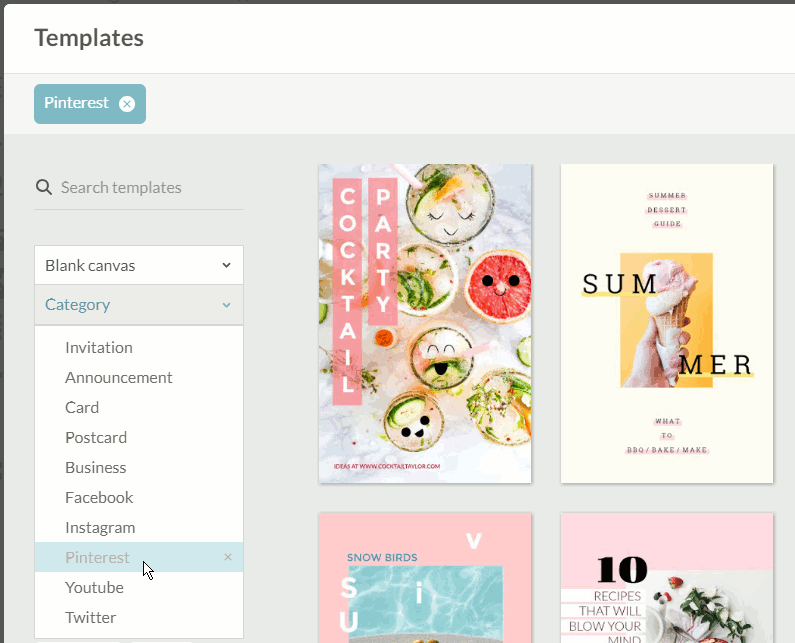 Canva is an excellent tool for preparing images for your website for sharing on social media and you can download and save the resulting images to your computer in several different formats. Paint.NET: This is a good photo editor for Windows PCs and it is free. There are lots of useful tools and a useful save window where you can select and preview output options, which is useful for optimising images. BeFunky: It says on the website that this is the best online photo editor ever. I don’t know about the best but it is brilliant and it is well worth trying. It is a general photo editor but it can upload photos, crop and resize, add lots of effects, add text, overlays, frames and more. It is a great tool. Fotor: You can do a lot with this online editor and after uploading an image you can fix problems with colour, exposure, sharpness and so on. A large number of filters can be applied and there are special effects like wrinkle remover, weight loss (easier than dieting), eye shadow and many more. Text can be added and a lot more. Lots of free content, even more if you pay. 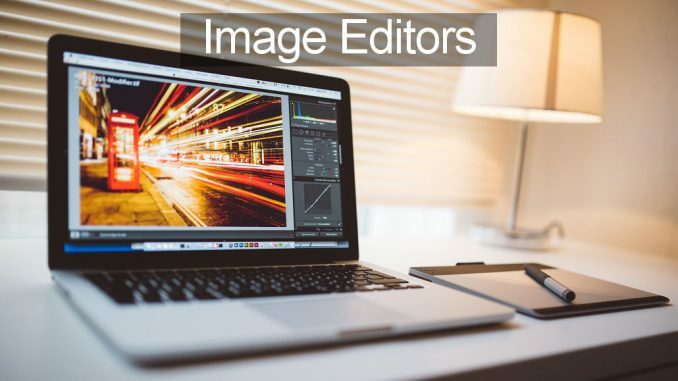 FotoJet: An excellent online photo editor that can also be used to create images for your blog, website, social shares and so on. It has some great text effects and a large library of clipart. Lots of free content plus more if you pay. Pixlr: If you can stand the ugly advert on the right side of the screen, Pixlr is actually quite a good photo editor that runs online in your browser. The interface is similar to GIMP, Photoshop and others and there are floating tool and information windows. Explore the site and you will find a free vector graphics software for creating illustrations. Canva is my go-to because of how easy it is to save and work with my templates. But I need to go check out that Photoshop Express. I like the crop sizes for all the social media services in Photoshop Express and it has good filters and tools.